Interested in offering TennisKids at your School? 1. How do I sign up my child for TennisKids? Our website provides a fully automated registration process. You can find your child’s school in one of two ways: Simply CLICK HERE and search the TennisKids school directory for your child’s school, or CLICK HERE to scroll through the list of current sessions. Under both options, there is a link to take you to your child’s school’s registration page. Once there, simply complete the short online form, followed by the payment processing form. TennisKids accepts Visa, Mastercard, AmEx, and Discover. Please make sure that your email address is entered correctly. We will use this address to keep in touch and advise you of any class delays, cancellations, make-ups, and new session announcements. 2. How old does my child have to be in order to signup? 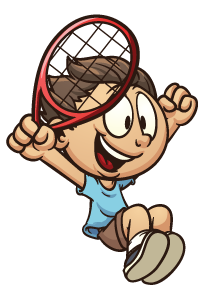 TennisKids welcomes children between the ages of 2 to 8 years old! 4. What is the schedule? A typical TennisKids Session runs one day per week for 10 consecutive weeks (10 Classes). Each class is 30 minutes in duration. TennisKids offers up to 4 Sessions per year. The program is always offered in the Fall, Winter, and Spring. Many schools offer a Summer Session as well. 5. Where are the classes held? TennisKids is an on-campus program! Our classes are taught at your child’s school on or around the playground area, maintaining a safe and secure environment for them. 6. What does my child need in order to participate in the program? A smile! Yes, that’s it! The TennisKids instructors bring everything needed in order to have fun on the TennisKids courts. Nets, balls, games, and racquets are always waiting for the kids at the start of each class. Our tennis kids simply can’t get enough of tennis! Once you start playing, you can’t stop! If your child would like to start playing tennis after school and on weekends, please CLICK HERE to purchase age-appropriate racquets, balls, and fun activities designed to encourage your little tennis star! 7. What should my child wear for a TennisKids class? It’s always a good idea to have your child wear loose-fitted clothing and a pair of running shoes on TennisKids class days. We won’t be running marathons, but comfort is always most important! 8. How can I find out if TennisKids is offered at my child’s school? 9. The session has already started, is it too late to register? Hurry up! You don’t want to miss another class! While we require that all registration forms be completed one week prior to the start of each session, exceptions can be made during the first 2 weeks (2 classes). During the period, please register your child online! If your child would like to join us after week 2, please let one of our instructors know and we will be happy to try to accommodate you. 10. What about make-up classes? TennisKids always offers make-up classes for weather-related cancellations. We will also reschedule classes in the case of a student holiday or other school-initiated events preventing us from teaching that day. At such times, parents will be notified via email. 11. My child had such a great time at TennisKids, how can I sign up for the next session? TennisKids will post links on our website to the latest sessions approximately 2 to 4 weeks before the next sessions begin. You are welcome to check our website and register anytime! We know that parents have enough on their minds as it is, so we will also be sending you a reminder email with a link to register for the next session!